1. Iguazu Falls, South America. These falls are located on the border of Argentina and Brazil and are one of the new 7 wonders of the world. Its brink spanning a distance of 2 km and an average flow of 1.3 million liters per second. The Iguazu Falls are consisted of about 275 individual waterfalls and cascades. 2. Victoria Falls, Southern Africa. This waterfall is located on the Zambezi River at the border of Zambia and Zimbabwe. It’s the largest singular waterfall in the world spanning a width of 1.7km, a height of 108 meters (355 ft) and an average flow of 1 million liters per second! It was declared a UNESCO World Heritage Site in 1989. 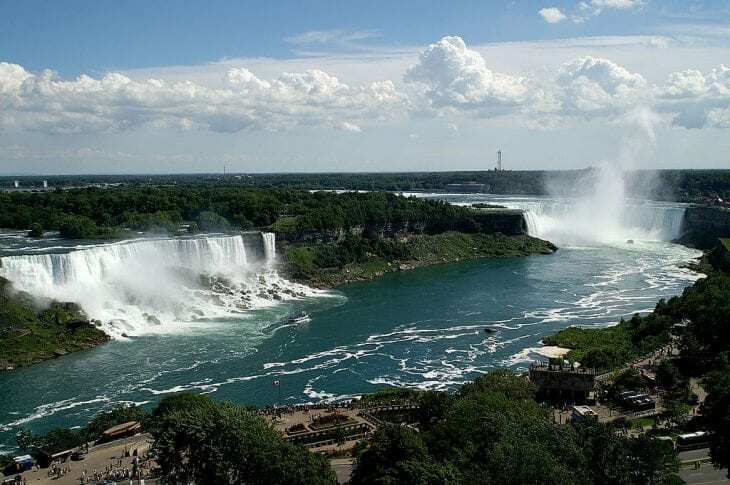 Perhaps the most famous waterfall in North America or the entire world, the Niagara Falls are located on the border of the United States and Canada. The Niagara ranks as the biggest fall by volume with an average of about 2.8 million liters per second (750,000 gallons). The first falls in this list to be located entirely in one country and the first from Europe. The Plitvice Falls are located within Plitvice Lakes National Park which is a UNESCO World Heritage Site. The falls are located all over the park between the lakes. It is the world’s highest uninterrupted waterfall, with a height of 979 meters (3,212 ft) and a plunge of 807 meters (2,648 ft). The waterfall drops over the edge of the Auyantepui mountain in the Canaima National Park. Yosemite Falls is the highest measured waterfall in North America. Located in Yosemite National Park in California. The total739 meters (2,425 ft) from the top of the upper fall to the base of the lower fall qualifies Yosemite Falls as the 7th highest waterfall in the world. A high-volume waterfall on the Potaro River in Kaieteur National Park. It is 226 meters (741 ft) high when measuring the primary plunge, and a total height of 251 meters (822 ft). While many falls have greater height, few have the combination of height and water volume, making it one of the most powerful waterfalls in the world. This waterfall is one of Iceland’s main attractions. It is located on the Hvítá River and consisted of two falls at 90-degree angles to each other. It has a total height of 32 meters and considered one of the most unique waterfalls in the world. Also in Iceland, this waterfall is Europe’s most powerful waterfall sending glacial meltwaters over its 45 meters (148 ft) plunge at a flow of around 500 cubic meters per second. Located near Milford Sound in New Zealand’s South Island. Height of 580 meters (1,904 feet). I visited Niagara Falss two days ago. Acording with information on signs over there the quantity of water is 75.000 liter/second and not 750.000 as is mentioned in this site.